After seeing the continuous crying of emperumAn [in the previous pAsuram], AzhwAr thought about his simplicity and became deeply involved in that. With that, he started praising him. Just as emperumAn’s thoughts were on stealing butter, AzhwAr’s thoughts were focussed on emperumAn. urai mEl koNdu – with words of significant meanings; i.e. on matters relating to words. Or, while speaking about something, carrying on with it. In other words, being fully engaged in it. en uLLam OvAdhu eppOdhum – my heart is continuously worshipping him. Since the svarUpam (basic nature) of jIvAthmA is to be subservient to emperumAn, there will be a change in being subservient only if the svarUpam is destroyed. Since svarUpam cannot be destroyed, this also will not change. varai mEl maradhagamE pOlath thiraimEl kidandhAnai – isn’t he reclining on thiruppARkadal just as an emerald gem is embedded on a mountain! kidandhAnaik kIndAnai – once his follower had any difficulty, he could not stay on his bed. Did he not immediately get up and tear apart the enemy! kEzhalAyk kIndAnai bhUmi idandhAnai – the two verses can be combined and meaning derived. 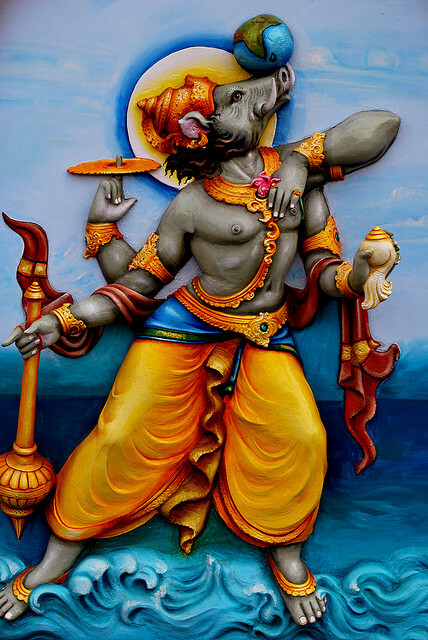 In this case, it will refer to his varAha avathAram (incarnation as wild boar), with kIndAnai referring to his removing the earth from the walls of the universe and idandhAnai referring to taking the earth on his tusks. Eththi ezhum – by continuously praising these activities in his incarnations, my heart will get uplifted, says AzhwAr. We shall consider pAsuram 26 next. This entry was posted in iyaRpA, mudhal thiruvandhAdhi on July 4, 2017 by T N Krishnan.